Joining a new company can be a daunting task for many. There are new things to learn, new people to meet and new business processes to grasp. It takes approximately 6 months for a new hire to be groomed into the ways of the new company and actually start being productive. Organizations spend considerable amount of time and resources to mold a new hire in their ways. Therefore, employee retention holds great importance. If an employee quits the company soon after they join it, it can prove disastrous as organizations are back to square one, and have to start the entire recruiting-training-readying process all over again. A high attrition rate affects the profitability as the company is under a constant state of turmoil. Customer sentiment may also dampen by having to deal with a different person every now and then. Hence, it is very essential to retain good employees, as long as possible. Employees who believe they are receiving poor training and learning opportunities are more likely to leave their jobs, compared to companies with excellent training programs. Employees now don’t just desire higher salaries and extended vacations, they want to grow professionally by acquiring new skills. In a brutally competitive market, where finding the right people is very difficult and costly, it is imperative that businesses do everything to retain good talent. Taking an e-learning course is much more flexible than a traditional course. Employees can be trained sitting at their desks, as per their convenience. E-learning courses also employ attractive and interactive learning elements such as videos, animations, game-based content, and infographics. This makes the training more appealing to employees, pushing them to give their 100%. Employees experience a greater transfer of knowledge and come out with a better understanding of their subjects. Customized e-learning, tailor-made for your organization, can immediately make new hires feel a part of their new company. All of these factors can positively influence an employee to be loyal to their organization. 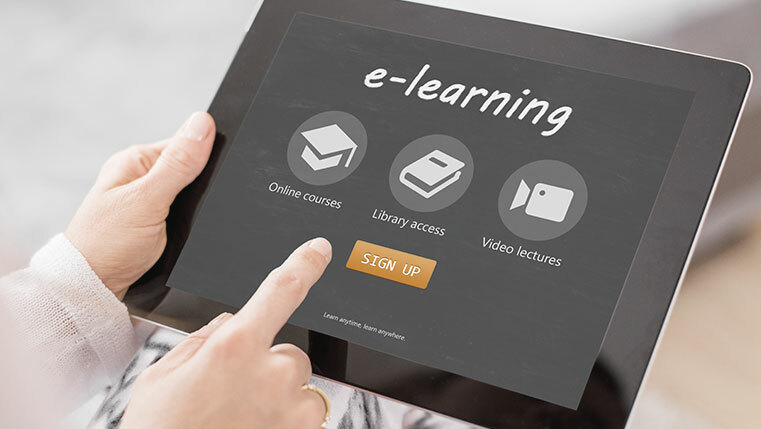 Employees trained through tried and tested e-learning courses, having sound instructional design principles, can retain information and skills much more efficiently. This directly corresponds to an increase in their skill set and confidence. A confident and well-trained employee will be able to perform the day-to-day tasks more effortlessly than an ill-trained one. Employees can achieve their targets with ease and feel more productive with each passing day. This increases employee satisfaction and makes your company a great place to work. An employee who sees his good work appreciated in a practical environment is much more likely to stay and nurture his skills further. There are an infinite number of things to learn in any domain. The train of learning should never stop after just a few ones. Employees rarely leave an organization just for a better pay. If your company keeps providing the platform to learn and apply new skills, then it maintains the excitement of working among employees. Employees, who see further development of their skill set and knowledge, also see a future for themselves in an organization. With rapid e-learning course development, you can keep up with the fast changing times of today’s business world. New training programs, having the same impact and professional values as the old ones, can be introduced like clockwork, assuring that your employees never feel stagnant. However, won’t a well-trained employee leave anyway and look for better opportunities elsewhere? Quite the opposite. If an employee is getting a good platform to improve professional skills, along with an environment to apply them, that employee is much more likely to stay. A great training program can increase employee morale, creating a virtuous cycle. Because employee morale is high, they feel more engaged. Because they are engaged, they’re more productive. Because they are more productive, they feel happier, their morale is high, and so on. Reduce your company’s attrition rate by giving your employees the high-quality training they deserve.